The passive case-finding approach of Revised National Tuberculosis (TB) Control Programme in India strongly affects the health-seeking behavior of TB patients, the timing of help seeking as well as the subsequent delays associated with the same. Studies carried out in different parts of India reveal a host of several factors for delay in seeking help and the reasons for not seeking help at all. 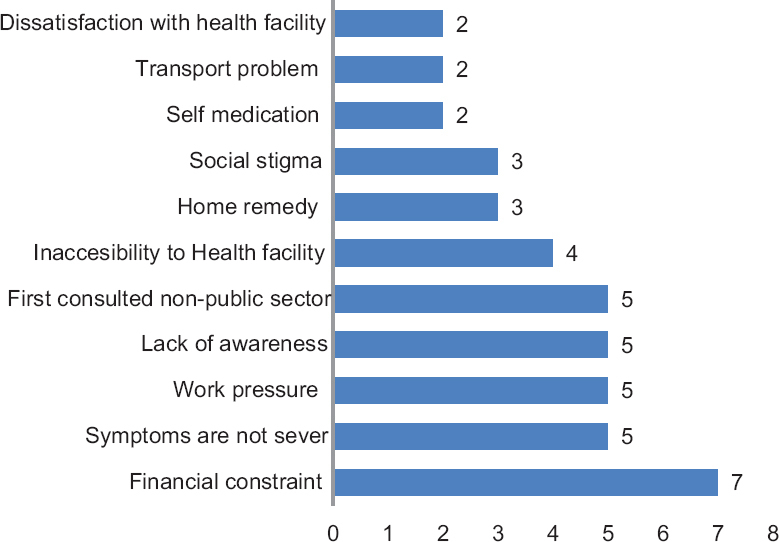 Important reasons for delayed health-seeking behavior include financial constraint, symptoms are not severe (as perceived by the patients), work pressure, lack of awareness, first consulted nonpublic sector, inaccessibility to health facility, home remedy, social stigma, self-medication, transport problem, and dissatisfaction with health facility. Similarly, the median patient delay ranged from 7 to 56 days as reported by various studies. Health-seeking behavior and related delays are of utmost importance in TB care from two important perspectives; first, TB requires timely treatment, and second, it requires protracted treatment. Required level of knowledge and a positive health behavior helps the patients in taking timely help from an appropriate health facility. Moreover, timely help-seeking prevents further spread of the disease and helps in establishing a TB-free society. Tuberculosis (TB) poses serious public health challenge in the world, mostly the developing countries owing to multiple factors. TB was ranked 7th according to the WHO's global disease burden report, 1990 and the predictions up to 2020 also confirm the same in terms of morbidity. The burden of TB in India is devastating as it contributes 300,000 deaths every year with an annual addition of 2.2 million new cases. According to a well-calculated financial burden report, the burden of TB leads to a loss of $23bn (£14.9bn; €20.3bn) per annum. The vertical program known as Revised National TB Control Programme (RNTCP) is the Government of India's flagship programme for the control of TB with a target of 85% cure rate and 70% case detection rate. After several years of implementation, India has achieved this global target of cure rate and case detection rate since 2007. Furthermore, the coverage rate of Directly Observed Treatment Short course in India is 100%, however, the problem of TB still continues in Indian communities owing to multiple factors. The basic issue of RNTCP implementation lies with its approach of passive case finding which is strongly linked with the health-seeking behavior of patients seeking care at public health facilities. The health-seeking behavior of a TB or chest symptomatic very often creates an option of choosing a preferred health facility, or a doctor for that matter, for the diagnosis and treatment of TB which solely depends on the choice of the beneficiary. Private health-care providers are mostly the first point of contact for these chest symptomatics or cough symptomatics in most of the Indian communities. Different studies in India reveal that 50%–80% of TB patients preferred to visit private health-care institutions or general practitioners. It has further been reported that the treatment offered at private health facilities has mostly been substandard.,, On the contrary, people in India are not aware of an existing free of cost public health program that takes care of TB patients. One of the studies at the P. D. Hinduja National Hospital and Medical Research Centre, Mumbai, India, reported that 85% (n = 200) of the people not exposed to TB are unaware of existing public health facilities for TB care. Very often this sort of behavior and ignorance leads to delayed health seeking at public health facilities in Indian communities. Studies in different parts of India reveal that the mean patient delay in seeking care ranges from 25 to 120 days  with patients meeting several of health-care providers before initiating the TB treatment., The health-seeking behavior of TB patients and various delays, patient delay and health system delay, may lead to grievous repercussions such as multidrug-resistant TB, extremely drug-resistant TB, and increased rate of out of pocket expenditure. The main objective of this literature review was to understand the delays in TB care among patients of different Indian states. Furthermore, the objective was also to understand all the three types of delays; patient delay, health system delay, and the total delay for TB care. In doing so, attempt has been made to understand the issue on a pan India basis. A manual search strategy was adopted to obtain relevant literature on delays in TB care in different Indian states. The search was primarily carried out in PubMed search engine. The literature review has not adopted a systematic review approach thus no inclusion and exclusion criteria were fixed before and after the literature search. Thus, the articles and items reviewed in this paper were handpicked, and attempt was made to understand delays in TB care in different Indian states representing different zones/directions/regions of the country. [Table 1] shows the number of studies carried out in different regions of India. Two broad categories of delays are primarily discussed in the context of TB care in India. These are known as patient delay and health system delay [Figure 1]. The patient delay is defined as the delay incurred by a patient after the onset of symptoms till the presentation to a health facility. The health system delay refers to the time interval between the presentation of a patient to a health facility till the initiation of treatment. It is the combination of diagnosis delay and treatment delay. Here, “diagnosis delay” refers to the time interval of presentation of a patient to a health facility till the diagnosis of TB. The “treatment delay” refers to the time interval from the diagnosis of TB to the initiation of anti-TB treatment. Total delay refers to the delay as a result of both patient delay and health system delay. It is the interval between the onset of symptoms till the initiation of anti-TB treatment. Several studies carried out in different Indian communities' revealed delays at various levels; patient delay, health system delay, and the total delay. A brief account of such studies is presented below. The cross-sectional community-based study conducted at Udupi Taluk, Karnataka, showed patient delay among 17.3% (n = 98) of the new sputum positive cases with a median delay of 30 days. The median health system, treatment, and diagnosis delays were 56.6, 2, and 54.5 days, respectively. The perception that the symptoms were not severe was the major reason for patient delay among 82% of the patients. Similarly, the important reasons for health system delay were non advice of doctors for sputum examination (82.6%) and seeking of medical care at private health facilities (76.7%). The study conducted at Chennai and Madurai among 606 participants showed that the median interval between onset of symptoms and seeking care at a health facility (both public and private) was uniformly 10 days in all categories of subjects (rural and urban) with slight differences in the range. The cross-sectional study conducted among 138 new sputum smear positive cases at Puducherry showed different delays in seeking care for TB; median patient, health system, diagnostic, and treatment delays were 36 days (12–351), 28.5 days (4–518), 67.5 days (18–431), and 10 days (2–436), respectively. The cross-sectional study conducted at the E-ward of Mumbai Municipal Corporation revealed that the patient delay was observed among 64.1% (n = 156) of TB patients with a median delay of 8 weeks. In addition to patient delay, provider delay has also been reported in this study. The study reported that the patients who had minimal delay are the more treatment adherent. The hospital-based cross-sectional study conducted among 656 cough symptomatics at the Rajendra Institute of Medical Sciences (RIMS), Ranchi, revealed significant patient delay in which acceptable patient delay (≤30 days) was observed in 24.39% (n = 656) and significant patient delay (beyond 30 days) was observed in 75.61% (n = 656) of the cough symptomatic. The cross-sectional study conducted among 300 patients in Chennai revealed that the mean patient delay is 18.3 days, the median being 7 days. The mean patient delay was more among illiterates, unemployed people, males, and patients with a per capita income of <Rs. 1100. Patients with extrapulmonary TB showed more mean patient delay (55.7) as compared to the patients with pulmonary TB (14.8), and this difference was found to be statistically significant (P < 0.001). This paper discussed about two broad categories of delays and the subcategories within these delays. The patient delay, as mentioned above, is primarily associated with the level of knowledge about TB, their behavior, and the social stigma associated with the disease. This is clearly evident from studies on TB which have shown that lack of knowledge about the causes, modes of transmission and treatment affects both health-seeking behavior of patients and program control strategy as well., Social stigma is strongly associated with TB in different Indian communities. Especially for female patients in India, harassment by in-laws, difficulty in getting married, and dismissal from the workplaces were reported as the major barriers to get appropriate treatment. Social stigma, lack of scientific awareness about the disease, and social commitments are other stated reasons for interrupting and defaulting from the treatment. These findings underscore the importance of understanding local needs and sociocultural aspects of the community to implement any disease control program, such as for TB, effectively. This requires an intersectoral coordination among various departments who understand the concerned community dynamics and involves departments and institutions such as Panchayat Raj Institutions, civil society organizations, religious preachers and leaders, and above all the health system itself. Similarly, health system delay in TB care is also equally important in the Indian scenario. In India, the RNTCP has a passive case-finding approach which is an important bottleneck in reaching out to a major section of the community which could have been possible by conducting an active case finding approach by visiting door to door. Given this situation, there are other issues of human resources for health in India, especially for RNTCP. Most of the field level staffs employed under RNTCP are contractual employees without any surety of permanent employment which is sometimes harassing for them. Many a time, these employees leave their job for better option creating vacancies, those who work do not get regular salaries and proper incentives. These problems are also related to delay in service delivery and negligence in service delivery. Thus, to control TB effectively and to avoid delays at health system level, a strong leadership at policy level and awareness among the health staffs is the urgent need. Delays, both at patient and health system level, are of utmost importance from public health perspective as the active TB cases are capable of spreading the disease in the nearby community. Thus, it is necessary to start early diagnosis and prompt treatment to ensure effective TB control in a particular community. Further, delay in diagnosis and treatment may worsen the condition of the patient leading to poor treatment outcome, including death of the victim. It is evident from the studies that patients primarily resort to self-medication and take the help of private practitioners and traditional healers as an initial consultation for their TB-related symptoms. However, this practice leads to rise of defaulter cases in the community primarily among those who receive TB care at private health facilities. An initial period of relief from the symptoms after receiving treatment from a variety of private setups creates a pseudo-impression of cure among the patients which invariably leads to delay in help seeking at appropriate public health facilities for complete treatment. The delay in seeking treatment is a major problem for the individual patient and the community as well. Thus, the high-risk population, the vulnerable and marginalized population, and those who are at the risk of getting affected with TB require proper education and counseling regarding the importance of early treatment and complete treatment which will ultimately lead to a TB-free society. Murray CJ, Lopez AD, editors. Summary: The global burden of disease: A comprehensive assessment of mortality and disability from diseases, injuries, and risk factors in 1990 and projected to 2020. Geneva and Boston: World Health Organization and Harvard School of Public Health; 1996. Udwadia ZF, Mehra C. Tuberculosis in India. BMJ 2015;350:h1080. TBC India. Directorate General of Health Services, Ministry of Health and Family Welfare, Govt. of India. Available from: http://www.tbcindia.nic.in [Last accessed on 2016 Sep 15]. Sreeramareddy CT, Qin ZZ, Satyanarayana S, Subbaraman R, Pai M. Delays in diagnosis and treatment of pulmonary tuberculosis in India: A systematic review. Int J Tuberc Lung Dis 2014;18:255-66. Uplekar M, Juvekar S, Morankar S, Rangan S, Nunn P. Tuberculosis patients and practitioners in private clinics in India. Int J Tuberc Lung Dis 1998;2:324-9.
International Institute for Population Sciences. India National Family Health Survey (NFHS-3), 2005-06. Mumbai: International Institute for Population Sciences; 2007. Kelkar-Khambete A, Kielmann K, Pawar S, Porter J, Inamdar V, Datye A, et al. India's Revised National Tuberculosis Control Programme: Looking beyond detection and cure. Int J Tuberc Lung Dis 2008;12:87-92. Pinto LM, Udwadia ZF. Private patient perceptions about a public programme; what do private Indian tuberculosis patients really feel about directly observed treatment? BMC Public Health 2010;10:357.
van der Werf MJ, Chechulin Y, Yegorova OB, Marcinuk T, Stopolyanskiy A, Voloschuk V, et al. Health care seeking behaviour for tuberculosis symptoms in Kiev City, Ukraine. Int J Tuberc Lung Dis 2006;10:390-5. 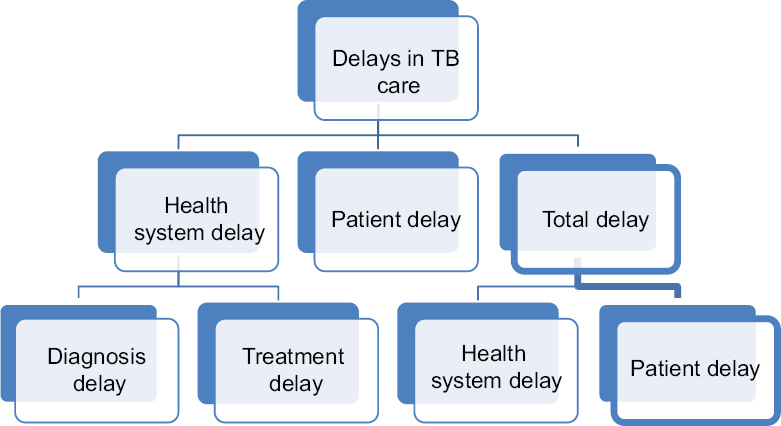 Rajeswari R, Chandrasekaran V, Suhadev M, Sivasubramaniam S, Sudha G, Renu G. Factors associated with patient and health system delays in the diagnosis of tuberculosis in South India. Int J Tuberc Lung Dis 2002;6:789-95. Selvam JM, Wares F, Perumal M, Gopi PG, Sudha G, Chandrasekaran V, et al. Health-seeking behaviour of new smear-positive TB patients under a DOTS programme in Tamil Nadu, India, 2003. Int J Tuberc Lung Dis 2007;11:161-7. Storla DG, Yimer S, Bjune GA. A systematic review of delay in the diagnosis and treatment of tuberculosis. BMC Public Health 2008;8:15. Goel K, Kondagunta N, Soans SJ, Bairy AR, Goel P. Reasons for patient delays and health system delays for tuberculosis in South India. Indian J Community Health 2011;23:87-9. Charles N, Thomas B, Watson B, Raja Sakthivel M, Chandrasekeran V, Wares F. Care seeking behavior of chest symptomatics: A community based study done in South India after the implementation of the RNTCP. PLoS One 2010;5. pii: E12379. Natesan M, Chauhan RC, Cherian J, Purty AJ, Singh Z, Joice S, et al. Patient and health system delay among new pulmonary tuberculosis patients diagnosed at medical college hospitals in Puducherry, India. Int J Res Med Sci 2015;3:188-93. Kulkarni PY, Kulkarni AD, Akarte SV, Bhawalkar JS, Khedkar DT. Treatment seeking behavior and related delays by pulmonary tuberculosis patients in E-ward of Mumbai Municipal Corporation, India. Int J Med Public Health 2013;3:286-92. Shamim H, Vidyasagar SS, Shalini S, Sneha K, Bhushan SS. Health care seeking behavior of cough symptomatics (pulmonary tuberculosis suspects) attending medicine outpatient department of a tertiary care hospital of Jharkhand. Int J Interdiscip Multidiscip Stud 2015;2:42-9. Ananthakrishnan R, Jeyaraju AR, Palani G, Sathiyasekaran BW. Care seeking behavior of the TB patients who were registered in an urban government tuberculosis control in Chennai, Tamil Nadu, India. J Clin Diagn Res 2012;6:990-3. Karanjekar VD, Gujarathi VV, Lokare PO. Socio demographic factors associated with health seeking behavior of chest symptomatics in urban slums of Aurangabad city, India. Int J Appl Basic Med Res 2014;4:173-9. Kaur M, Sodhi SK, Kaur P, Singh J, Kumar R. Gender differences in health care seeking behaviour of tuberculosis patients in Chandigarh. Indian J Tuberc 2013;60:217-22. Thakur R, Murhekar M. Delay in diagnosis and treatment among TB patients registered under RNTCP Mandi, Himachal Pradesh, India, 2010. Indian J Tuberc 2013;60:37-45. Nimbarte SB, Wagh V, Selokar D. Health seeking behaviour among pulmonary tuberculosis patients in rural part of central India. Int J Biol Med Res 2011;2:394-7. Jayachandran V. A case study on tuberculosis treatment defaulters in Delhi: Weak health links of the community with the public sector, unsupported migrants and some misconceptions. Ann Trop Med Public Health 2014;7:124-9. Engel N, Bijker W. Innovating tuberculosis control in India. Econ Polit Wkly 2012;47:111-8. Samal J. Health seeking behaviour among tuberculosis patients in India: A Systematic Review. J Clin Diagn Res 2016;10:LE01-6. Uplekar MW, Rangan S. Tackling TB: Search for Solutions. Bombay: The Foundation for Research in Community Health; 1996. Atre SR, Mistry NF. Multidrug-resistant tuberculosis (MDR-TB) in India: An attempt to link biosocial determinants. J Public Health Policy 2005;26:96-114. Purty AJ, Chauhan RC, Natesan M, Cherian J, Singh Z, Sharma Y. Patient and health system delays among adult smear-positive tuberculosis patients diagnosed at medical colleges of Puducherry in South India. Indian J Public Health 2016;60:77-80.